Become a Vital Ally in Your Students’ Educational Journey. There is a vital need for special education teachers in California’s classrooms. The Preliminary Education Specialist Teaching Credential Degree Program offered by the California School of Education (CSOE) at Alliant International University will prepare you to become a special education teacher in K-12 classrooms, as well as within other instructional settings geared for children and adults up to age 22. You will serve as a vital ally to students with mild-to-moderate disabilities and their families. Our program is approved by the California Commission on Teacher Credentialing and takes you through coursework in curriculum and instruction styles—preparing you to work effectively and with diverse student groups. During your time in the program, you will participate in one of two different student-teaching tracks that give you the experience you need to be a leader in the classroom from the moment you step off of our commencement stage. Heed the call to serve our children and arm yourself with the tools you need to become an agent of change, inspiration, and advocacy. No matter who we are, we all learn a little differently. That’s why Alliant has created two routes to success in the Online Special Education Credential program. Making the most of our partnerships with schools around the area, we’ll support you in networking and finding the ideal placement for your future goals. During this track, you complete a 16-week, unpaid student teaching placement in at least two grade levels under the guidance of a mentor teacher. This path is optimal for studying teaching methods and preparing you for classroom application before you even start your career as a full-time teacher-of-record. Can’t go the unpaid route? No worries. The Intern Teaching Option lets you pursue your teaching certification while earning an income, meaning you assume immediate and full teaching responsibility and management of the classroom. This option works best for those coming into the program with previous classroom experience. Often, it’s the small leaps that lead to the most growth. Take the leap by dually enrolling in our online Master of Arts in Education with Teaching Emphasis program. How it Works: As a student in the Preliminary Online Special Education Teaching Credential program, it only takes two more courses to earn your MAE in Teaching. That’s because your Special Education coursework can be applied to your master’s. Even better, the MAE courses are all online. Why it Works: A master’s degree helps you develop expertise in teaching and theory that you can apply in the classroom. Plus, you can create new pathways of opportunity in your career. What is the career outlook for graduates of the Preliminary Special Education Teaching Credential program? The career prospects for those working toward becoming a special ed teacher are strong, as the nation’s population continues to rise at a relatively steady rate. 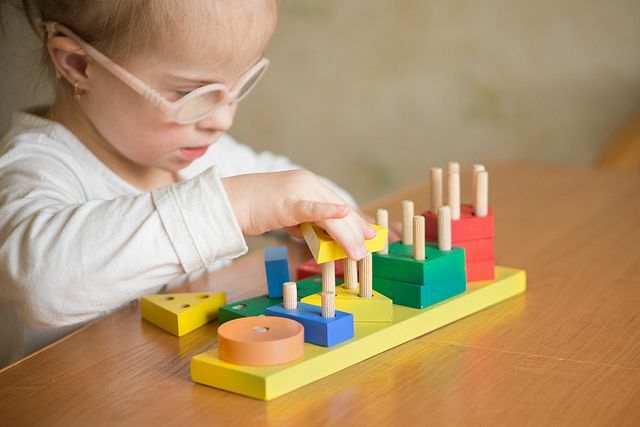 Primary and secondary education enrollment in special education programs has increased slightly in the past couple of years, and demand for special education services and teachers should rise as children with disabilities are increasingly being identified earlier and enrolled into special education programs. Ultimately, with the Bureau of Labor Statistics projecting an 8% growth rate from 2016 to 2026—or, slightly more than 33,000 positions—there is reason to be optimistic about the future of special education in the U.S. Graduates of our Preliminary Special Education Teaching Credential program will often end up teaching at the elementary-, middle-, and high-school levels—largely dependent on exactly what age range each individual person would care to teach. Other career options include becoming a school principal, adult and secondary educator, specialized child care, special education classroom materials creator, policy maker, and a professional tutor. Additional Financial aid is available for those who qualify in the form of loans, grants, federal work study, and military aid. Learn more about financial aid options here. Does completion of this program prepare me for my licensure exams? Upon completion of this program you will have to complete two different licensure exams here in California—the CSET and the RICA. These are standard examinations that all special education teachers have to pass, regardless of the program they have graduated from. Alliant’s credential and authorization preparation programs are approved by the California Commission on Teacher Credentialing. Successful completion of the program results in a preliminary teaching credential recommendation to the CTC. When does the Preliminary Special Education Teaching Credential program start? The Preliminary Special Education Teaching Credential is an 8-week term program and is open for enrollment during each of those respective enrollment periods. You can find a copy of our 2018-2019 8-week term academic calendar here. How long does it take to complete the Preliminary Special Education Teaching Credential program? The Preliminary Special Education Teaching Credential is a 27-credit program and takes a minimum of 1 year to complete, over 5 terms. Education is the great equalizer. Help ensure that every student in our nation has access to a quality education. Expand your reach while expanding your career opportunities with our certificate programs. The Special Education Teaching Credential Program is only offered as an online program. Explore our online programs below.